This was Jeff's first nationally released recording. This is the one that still has fans showing up at concerts with Woodpecker tattoos! The Title track Woodpecker Stomp, went on to become the first instrumental ever to break into the top 10 on the ccm rock charts! 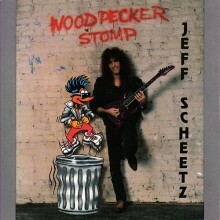 Woodpecker Stomp was also in heavy rotation on the nation’s number one rock station “Z-Rock”. This has been out of print for some time and is available here as produced by Jon Mathias in its original mastered version.